Up-Front Pricing! No Extra Charge On Weekends! At Capital City Plumbing, Inc., quality work and outstanding customer service are our top priorities. We are focused on building lasting relationships with our customers and becoming an asset to our community. Each member of our service team is knowledgeable, considerate, and trustworthy, and each strives to exceed customer expectations…every time. We are locally owned and operated. Our team may have grown over the years, but we still strive to provide the same level and quality of service that we did when Capital City Plumbing first began. 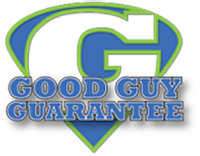 And as you’ve probably already heard, we’re the home of the Good Guy Guarantee. Click here to meet our Good Guys (and gals).